As Barack Obama’s presidential inauguration approaches, a quick tour of the news across the globe highlights several major themes: First, many are concerned with how Obama will handle the Palestinian-Israel conflict and what the effects will be on <?xml:namespace prefix = st1 ns = "urn:schemas-microsoft-com:office:smarttags" />Middle East relations. Second, Canada and South America are concerned with the U.S. relations with Latin America under the new president. Third, Obama’s economic policies weigh heavily in international coverage. Finally, many question what his policy on torture will be and if he will actually close Guantanamo as he has promised. Expectations for Obama are high, but with mounting crises at home and internationally, everyone seems to understand that he has a lot on his plate in the coming months. “Washington has neglected Latin America since 9/11 and snubbed advice or direction from other regimes when dealing with troublesome issues such as the embargo against Cuba or dealing with Venezuela’s anti-American President Hugo Chavez. “Americans should be more interested in dealing with Latin American than they are in dealing with more troublesome regimes such as Azerbaijan or Kazakhstan. “Mexico is the most critical problem facing the U.S. and the hemisphere today. Some 4,000 assassinations of government and police officials have occurred in the past year alone in the country as the cartelistas push back against efforts to curb drug smuggling into the U.S. Mexico threatens to become the next Colombia – a failed state weakened by lawlessness, corruption and intimidation. “The implications are grave: More illegal immigration spilling into the U.S. from Mexico as opportunities and economic growth stalls as well as disaster for Mexico’s tourist/snowbird industries as a result of more murders, kidnappings and robberies. “Many believed that the election of Barack Obama was going to mean change across the board. But the president-elect’s silence on the ongoing conflict in the Gaza Strip has led to speculation that the U.S.’s support for Israel is about to continue unabated. “Some Vancouver Palestinians say that Obama was never change they could believe in. “President-elect Barack Obama promised here Monday at a meeting with Mexico's Felipe Calderon that his administration will mark a new chapter in relations between the United States and Latin America. “Obama praised the ‘extraordinary courage’ of the Mexican leader in his fight against drug trafficking, while Calderon said that Monday's meeting represents ‘the beginning of an extraordinary epoch of cooperation’ between the two countries. “President Hugo Chávez of Venezuela threw down the gauntlet to his soon-to-be counterpart in the United States, Barack Obama, demanding to know where he stood on Israel's military action in the Gaza Strip. “The Bush Administration has served as an easy target for Chávez' brand of populist, nationalist anti-Americanism, but the prospect of Bush being succeeded by Obama has posed questions about how the Venezuelan leader would handle his dealings with the new president. “President-elect Barack Obama's nominee as Secretary of State, Hilary Clinton, made it clear in her confirmation hearings that the new US administration will seek a policy of engagement with Iran. “Nobody here, though, is hugely hopeful that this will necessarily secure an agreement by Tehran to halt its uranium enrichment programme. In this respect, the Obama Administration inherits a dossier where time is running out. "’When you have a US President who comes with a different philosophy of engagement and dialogue it is going to create cleavages in Tehran, between those people within the Islamic Republic who say its about time we had a different relationship towards the world and we did away with this 'death to America' culture of 1979, and those who are very firmly entrenched in this revolutionary ideology and are really incapable of changing,’ says Mr Sadjadpour. "’Some Iranians think they need nuclear weapons; others argue that to build nuclear weapons would be a mistake, because it would upset their neighbors, destabilize the region and make them a target of international hostility,’ Mr Samore says. “He is clear though that there is a pretty strong consensus, at least among the ruling elite in Tehran, to create a nuclear weapons option. “Barack Obama expressed disappointment yesterday with the Bush administration's handling of the first $350bn tranche of the financial sector bail-out and pledged greater support for struggling homeowners. “Aides to Mr Obama are pushing the White House to request the final $350bn (€260bn, £230bn) of troubled asset relief programme (Tarp) funds from Congress this week so the cash would be available soon after he takes office on January 20. The White House has acknowledged it was talking to the transition team about the release of the second tranche of Tarp funds but said no decision had been reached. "’I, like many, are disappointed with how the whole Tarp process has unfolded,’ he (Obama) said on ABC's This Week. He said the Bush administration had not done enough to help avoid foreclosures. “His new target to save or create 4m jobs, announced on Saturday, was the second time in three weeks he had raised the goal. He originally said the stimulus would generate 2.5m jobs before upping it to 3m last month. “Western Europeans (Germany, France, Britain, Italy, Switzerland, Spain, the Netherlands, Sweden, Denmark, Norway, Austria, Finland) think that the U.S. will pay more attention to human rights under President Barack Obama and that America's image abroad will improve. “In every country polled, a majority of people think poverty in the U.S. will tend to decline under Obama rather than increase. Americans also are of that opinion, but to a lesser extent than all the other countries. “In every country but Russia people are convinced that environmental issues in the U.S. will improve under President Obama. “Every country has higher hopes than the U.S. that the chances for world peace will improve under Obama. However, even in the U.S., more people agree rather than disagree with that view. “A large majority (90 percent) of Western Europeans (75 percent of Americans) think that tensions between Muslims and Christians will remain the same or decrease. “The ‘lady in the pantsuit,’ as Clinton often described herself during the election campaign, has a clear preference for using "smart power" in pursuing U.S. interests abroad, a neoliberal response to the neoconservative failure. “The idea is to charm the world and, if and when necessary, enforce the U.S. will on it by integrating military and other ‘hard’ instruments with such ‘soft’ elements as trade, diplomacy, economic and other assistance, and the spread of U.S. cultural and political values and lifestyle. "’America cannot solve the most pressing problems on our own, and the world cannot solve them without America,’ Clinton said in a confident and businesslike appearance before her former colleagues on the Senate Foreign Relations Committee. “No US president in recent memory has entered office facing such huge crises or such enormous expectations as Barack Obama. The Democratic president-elect is to be inaugurated on January 20 as the country's 44th president, elected with a strong 53 per cent majority by voters disillusioned with eight years of Republican George W Bush. “The American public believes Obama will not only lead them out of two increasingly unpopular wars and restore the country's tainted image abroad but also rescue them from the economic free fall that has brought worst worldwide financial crisis in more than 70 years. “Yet even though Obama felled the ultimate US racial barrier by being elected the first black president, that feat has faded to a footnote as he rolled up his sleeves in the first week of January to begin bartering with a resistant Democratic Congress over his request for another $800 billion to stimulate the flagging economy. “All told, he has projected supreme confidence that he can conquer whatever came along, while warning that the economic recovery will be slow. “For a world which sees the US tarnished by Bush's go-it-alone attitude, the controversial Guantanamo prison camp and the US military abuses against detainees at Abu Ghraib prison in Iraq, Obama has pledged to restore Washington's international standing through more direct diplomacy and a return to the respect for human rights that has been one of the nation's historical hallmarks. “The Palestinian-Israeli conflict is bound to be an international crisis U.S. President-elect Barack Obama has to face when he takes office. It will also pose a direct test for him to display his capability and wisdom in managing international crises. “The Israeli army's choice of timing for the offensive shows its worries for Obama's election as the US president: First, Barack Obama has not been so pro-Israel as his predecessor President George W. Bush. “Second, Israel has a lot of doubts in mind about the Middle-East policies of the new US government. In view of Obama's open speeches or statements, the Israeli side deems the new US administration could possibly adjust its policies toward Iran, Syria, Hezbollah and Hamas with a fear that such adjustments will disfavor Israel or be disadvantageous to it. “Thirdly, Obama's endeavor to adjust the U.S. foreign affairs policy and security policy would even misplace Israel's interests. Obama said he would withdraw combat forces from Iraq and instead switch his focus to Afghanistan and Pakistan. This indicates U.S. would possibly lower its attention to Israeli security. “The test of the Palestinian-Israeli conflict for Obama is, in essence, a test for the U.S. Middle-East policies, which will inevitably weigh impact on the future development of the Middle East situation. How Obama tackles the Palestinian-Israeli conflict will provide a new basis for the future US-Israel ties and US-Arab ties. If the conflict fails to be handled properly, the U.S.' Middle East policies for the years ahead will be hampered, and the entire Middle East Peace process will be put to a severe test. “Moreover, the Palestinian-Israeli conflict can also possibly jeopardize the adjustment of U.S. policies concerning Iraq and on the war against terrorism. The aggravated conflict will give rise to intense vibrations in the Middle-East region, and this could possibly compel Obama to observe carefully again and mull over to shift the anti-terrorism center to Afghanistan and Pakistan. “Soon-to-be President Barack Obama will have to move quickly both to distance himself from the Bush legacy and to set America on a bold new path in its relations with the Arab and Muslim worlds. The Obama administration must send a clear message that America stands for self-determination and the rule of law and human rights for all, Palestinians as well as Israelis. It is time for the United States not only to pressure Hamas, but also to place similar pressure on a ceasefire, an end to Hamas rocket attacks, and Israel’s destruction of Gaza and collective punishment of those who under international law have a right to resist occupation. America’s continued uncritical support for Israel has not been to the United States’ advantage. It has fuelled the legitimate anger of the Muslim world, supplied justification for terrorism, and sullied our image, reputation and moral stature globally. “…It’s also imperative that that the US plays a more objective and balanced role in the Palestine-Israel conflict. There can be no peace in the region unless the US gives up its policy of one-sided and totally biased support for Israel. “The gravity of what Mr Obama must accomplish at home and abroad requires him to build a broad coalition – and on balance he has. But among the team that Mr Obama has assembled in Washington there are far too few Muslims and Arabs. “Mr Obama should not opt for diversity simply for diversity’s sake, but in understanding the Middle East, the inclusion of Arab and Muslim American voices would seem to be essential. While Mr Obama has chosen Ray Lahood, a Republican of Arab ancestry, as his Secretary of Transportation, Mr Lahood’s policy portfolio does not have much bearing on America’s stance or standing in the Middle East. President Obama’s policies will be heavily influenced by his Vice President, Joe Biden, and Hillary Clinton, his Secretary of State. Both are experienced in foreign policy but that may be as much of a burden as a blessing in fashioning new policies for the Middle East. Both are among Israel’s most unapologetic defenders. “Barack Obama, the US president-elect, should put human rights at the centre of his foreign, domestic and security policy to undo ‘the enormous damage’ of the Bush years, a leading rights group has said. “Barack Obama will issue an executive order to close the military prison at Guantanamo Bay, probably in his first week as US president, two of his transition team advisers have said. “The prison is unlikely to be shut until a solution is found on where to house its inmates, but a presidential order would start the process of deciding what to do with the estimated 250 detainees remaining there, most of whom have never been charged with a crime. “The complete policy paralysis that has prevailed during the interregnum between Presidents Bush and Obama has not helped. US policy has devolved into a sort of ‘wheel of fortune’ game for financial firms. “One day you get bankruptcy, another day loans with few strings attached. One hopes that President-elect Obama’s all-star economic team will at least adopt a coherent and consistent policy. Consistency alone would be a big boost for confidence. “The basic elements of a recovery package include, first and foremost, a rational approach to rebooting the financial system. “Obama is an inspiration, and his victory a deeply affecting one, but he’s not our president — our claims on him ring hollow, and the true beneficiaries of the revolution (and its true authors) are people who live 16,000 kilometers from here. “Yet our expressions of hope and elation signify a yearning for something — for an Obama we can call our own, without the compromise of celebrating a foreign leader. “We yearn for our own Obama, given the fact that the one we could have had is the one we let slip away. “So, for Obama, the next four years will reveal the reality behind his rhetoric. “The expectation is that, to a large extent, he will be able to fulfill his promise (something about the content of his character implies that he is a man whom challenging times will hone to greatness). “We look 16,000 kilometers away hoping that the coming morning will be an endless November 5 — a tableau of hope and history and joyous tears. “Barack Obama’s choice of Hillary Clinton as Secretary of State, his retention of Defence Secretary Robert Gates and his reliance on much of the same economic team that bequeathed us the current financial implosion has led many supporters to wonder whether his promise of change amounts to little more than spare change. “Others say he’s simply being shrewd, employing establishment figures to enact a transformative agenda. “Given his hybrid identity and harsh apprenticeship, Obama may simply be a split-the-difference pragmatist. Or he may represent a new genre of politician for a post-partisan age, a “both-and” leader seeking to break out of the either-or dichotomies that so bedevil politics as we know it. 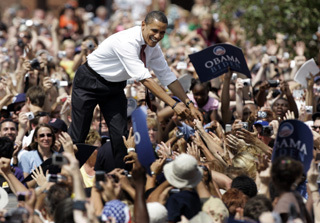 “Obama is thus perhaps best seen as a potentially transformational figure in American and global politics. “Obama’s integrative approach, listening to conflicting points of view, then synthesizing their best elements, could begin to unlock the immense creative potential inherent in conflict. “As a transitional leader who embodies the effort to reconcile conflicting races and cultures of many kinds, Obama seeks nothing less than to bend the arc of history. This is surely more responsibility than any individual can bear. “If we want a world that actually addresses its challenges rather than exacerbating them, we’ll need to engage in the hard work of reconciling not only the conflicting constituencies in our politics but the conflicting impulses within ourselves. “Obama presents an admirable example of how to transform a potentially crippling inner conflict into a potentially healing political process. “As the inauguration of Barack Obama draws closer, a debate rages in the United States: will he or won't he act to bring to account the senior Bush Administration officials who authorized and promoted the use of torture? “Is it enough to have voted for a new president who has promised his administration will not torture? Will that alone prevent it from happening again? Many Americans think not. "“Chavez is quite unleashed and is accused of gulag-like jailings"
this is the first time i hear such lie. Go back to school kid, you must have dropped out of the ethics course, or may be your school did not teach such subject. You are just a sad mercenary pen hire to lie and misinform. What a shame.